MONDAY, June 20th-I cannot remember a time in my life that I didn’t know Miss Mary Lee. It seems some of the earliest memories I have of my small hometown include those of going with my mother to her china and gift store on Covington Street to buy something else she probably didn’t need or for her to learn the fine art of painting china with some kind of special black paint that magically turned gold when you put it in the oven. The store back then had a very distinctive aroma of this special kind of paint and even today, if I ever get a whiff of something that smells remotely similar, it immediately conjures up images of numerous trips to “Mary Lee’s” and another afternoon gone that I could have spent getting into trouble. To a child, the visits seemed like hours and hours of time when in reality, it was probably a half hour to an hour at the most. Clocks run at different speeds depending on your age you know. Mary Lee was seemingly possessed of abundant energy, was a bit intimidating at times and never seemed to slow down back in those days. She could give the appearance of doing several things at one time such as painting a piece of china; talking to my mother; answering the phone and fussing at me for being…..well, ME….but there was always humor and laughter behind anything she said and as time went on, I found myself growing fond of her. I generally didn’t have much choice but to let her fuss because when we went to the store, I usually had to sit over to the side and not leave that small area; apparently, from what Mom said, there was some bull that lived in the china shop and I was better off staying in my corner and out of the way in case the bull got loose. I have to say that in all the years I visited her store, I never once saw that bull but I did get to see some cows once and that is how I met Mr. George. I suppose it didn’t occur to me back then that Mary Lee was married because I never saw anyone around her place but customers and I guess it was some time before I figured out that Mr. George usually stayed out of the china shop as much as possible. I was old enough then to escape the corner and it was a warm day outside. Bored and ready for Mom to finish up whatever it was she was doing in the shop, I was kicking gravel around in the yard when the door to Mary Lee’s house (which was right next to the shop) opened up and a man walked out wearing a cowboy hat. I was learning about the Presidents in school at the time and except for his lack of the mustache, he struck me as being a lot like what Teddy Roosevelt must have been like…he just had that kind of presence. He also was very quick to ascertain the cause of my mood and asked me if I’d like to ride out with him to check on his cows. I had this vision of him literally mounting a horse and riding out on the plains to check on his herd but as it was, his horse was a Chevrolet or GMC pickup and his herd was actually located at a dairy he had just a few miles down the road. Despite this dose of reality, he was always a larger-than-life character as long as I knew him and as I began to attend “big church” at Jackson Methodist, I came to know him and Mary Lee both a lot better because they also attended there. If George’s horse of choice was a pickup truck, Mary Lee’s was a Cadillac and it was always a late model, shiny and loaded with chrome. When I turned 16 and got my driver’s license, I would make extra spending money washing cars and Mary Lee’s was always a favorite even if it was enormous and took longer to clean all that chrome, plus wire wheels and whitewall tires. I would pick up her car and take it to my house to wash and a 16 year old feels pretty important driving a shiny black Fleetwood Brougham from one end of town to the other. After getting it clean and shiny, her ice cold “automatic climate control” air conditioning felt wonderful on the way back to her house to exchange it for my car with its frequently-broken air conditioner. I was always very careful with it, observant about how I drove it in those times before cell phones and I never put a scratch on it. Over all the time I knew her, she had several of them, usually very conservative in color but I figure she must have had a wild streak once because one day a few years ago I saw Mary Lee, well into her eighties by then, sitting at a traffic light in a brand-new, bright red one. I kidded her a lot about that red Cadillac and she would ask me when I wanted to come get it and wash it for her. I should have taken her up on that. When I graduated from high school, I received a lot of graduation gifts, most of them money in cards but a few other things as well. I don’t remember very much about what I was given by most of my benefactors but one thing stands out; a small china statue of a boy wearing a cap and gown and carrying a diploma with a personal message in gold painted on the bottom of it from Mary Lee. She enjoyed giving personal and meaningful gifts to people and having her own gift shop gave her the perfect platform to do it from. It is a gift I am personally very proud of and probably one of maybe three that have stood the test of time from that day long ago. She always had a way of making you feel special when she turned her gaze and smile your way and when I was little, she always sent me on my way with a hug and usually a piece of candy or some treat she might have in her shop; later the treats were replaced with encouragement, advice and wisdom but the hugs never stopped. When I preached a sermon, Mary Lee was always back there on her bench near the back of the sanctuary, on the left side from my view and if we made eye contact, she would convey with a nod her approval of whatever I was exhorting on at the moment. She was one of my severest critics and one of my biggest fans depending on what was called for and she always knew what that was at the right time. I always made it a point every Sunday, whether I was doing the Liturgy, preaching or singing in the choir to go down before church started and get my hug from Mary Lee-they were great confidence boosters- and if I ever forgot to do this, she reminded me of it later. I will miss that hug more than I can imagine. A few years after my son was born (and Mary Lee was all over him too) my wife bought him a toy at Christmas to play with. It was a Fisher-Price Christmas sleigh, complete with eight reindeer and two of their “little people”, Santa Claus and Mrs. Claus. Little People have come a long way since I was a child; back then, they consisted of a body that looked like a peg, a round head and no appendages of any kind. How they ever drove their little cars I will never know, for they had no hands or feet. Today, they really look like little people and they were some of his favorite toys for several years. He played with Santa and Mrs. Claus long after Christmas was a memory and one day he and I were at the church and stopped by Mary Lee’s bench to say good morning to her. She gave me my weekly hug and then ignored me while she talked with my son for a few minutes. A good while later, when we had settled in for church, he turned to me and said “She’s a nice lady” and I said “who is?” and he answered “Mrs. Claus”. I didn’t understand what he meant but when I questioned him a little more, I realized that he was talking about Mary Lee. From then on, he was convinced (and still believes I think to some degree) that she was Mrs. Claus because he thought she looked like his Little People Mrs. Claus. I think that children perceive more than we adults do though and when I thought more about it, I could see Mary Lee in that role, working in her little workshop and selling gifts, giving out treats to children and spreading good will and cheer. 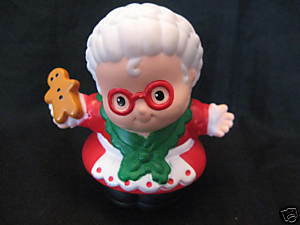 In that regard, she’s a dead ringer for Mrs. Claus and I never dissuaded my son from thinking of her as that. Mary Lee loved that story when I told her about it. For many years after George went on to be with our Creator, Mary Lee soldiered on, running her shop, going to church, visiting her friends and driving her Cadillac all over town. In my eyes, she never really aged and she always looked much the same to me, full of energy, spirit and cheerful good will. Even over the past year, when health problems plagued her, she didn’t noticeably change from the person she had always been and I appreciated her more when I saw her at church because I saw her less often depending on how she was feeling. She never let things get her down and over several decades, gifts from her shop touched many lives all over our community and even outside our state. My own mother-in-law rarely missed an opportunity to go to Mary Lee’s when visiting from Florida and she always found just the right something to give as a gift or to add to her own collection of things. People like Mary Lee are rare treasures that we need to appreciate when they are among us because those good memories will keep them alive when they are no longer here. This afternoon, Mary Lee joined George in her Father’s house, having lived 93 good, active years. She was one of the last of her generation in my church, a generation who has been inspirational to me and much loved by everyone. I know she is in a better place but Mary Lee always thought this was a pretty good place to be and she made the most of her years while she lived them. She had lots and lots of friends and if you can judge a person’s wealth by the number of friends they have, then she was a very wealthy woman who will be missed by all those who cared for her. As for myself, thank you Mary Lee for giving me so much of your life, for your friendship and for your encouragement. I hope I will always live up to your expectations.